New Delhi. 14 January 2015. 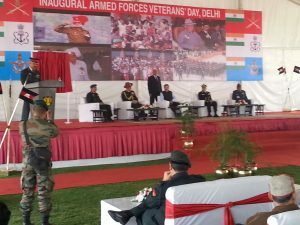 For the first time the Indian Armed Forces celebrated the Veteran’s Day on 14th January, the day on which the first Field Marshall General KM Cariappa retired from service. Addressing the Inaugural Armed Forces Veterans’ Day function at Delhi Cantonment, today, Dr. Bhamre said “Veterans are an essential part of the Armed Forces family who are the keepers of our values and culture and it is our duty to respect and honour them as they are an unbreakable link between the present and the past.” He assured the veterans and their widows that the Central and State Governments and all the Service Headquarters are fully committed to look after them. Dr. Bhamre in his speech dwelt upon different welfare measures taken by the Government for the well-being of the Veterans. He mentioned that last year some important steps were taken like establishment of the Directorate of Indian Army Veterans at Delhi Cantt and the process of establishing a veteran vertical in each Area and Sub-Area level has begun to look after their welfare. The Minister informed that every year Ex-Servicemen rallies are organised to look after the pension grants and health needs of Veterans and their dependents and 102 such rallies were successfully organised last year. The Minister said, the Government under the leadership of Prime Minister Narendra Modi implemented One Rank One Pension (OROP) scheme, a demand which was pending for implementation for the last more than 40 years. The current position on disbursement of OROP arrears as on 27 December 2016 are as follows:- 1st instalment amounting to 3,994.49 crore has been disbursed to 19,69,385 Ex-Servicemen, while 2nd instalment amounting to 2,290.72 crore has been disbursed to 15,54,849 Ex-Servicemen. The total number of Ex-Servicemen eligible for OROP are 20,72,457. The Minister particularly stressed upon the Skill Development of Veterans so that they can contribute effectively to the nation by starting a new innings in their career. 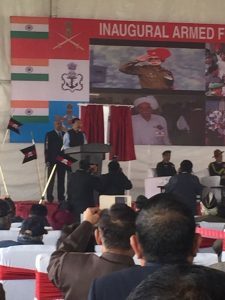 He also stated that the ECHS, through its polyclinics all over India and Nepal is working effectively for the health care of the Ex-Servicemen. 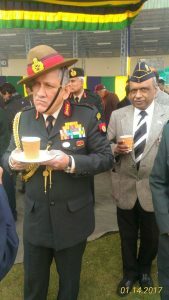 The function was attended by many Ex-Chiefs of the three Services and serving Chief of the Naval Staff Admiral Sunil Lanba, Chief of the Army Staff General Bipin Rawat, Vice Chief of the Air Staff Air Marshal SB Deo, Chief of Integrated Defence Staff to the Chairman Chiefs of Staff Committee (CISC) Lt Gen Satish Dua amongst hundreds of Armed Forces Veterans.